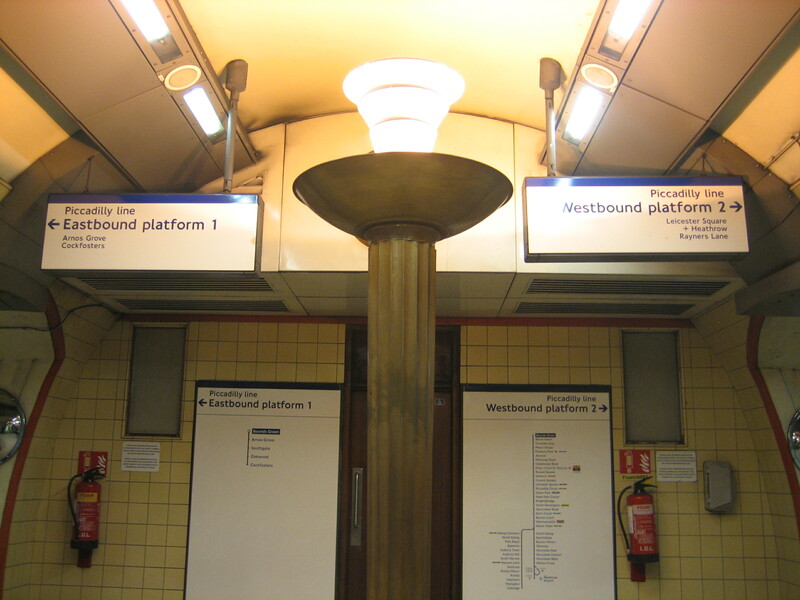 The trio of bronze uplighters, two in the passageway between the platforms and one in the entrance hall, were the work of a man who is also going to make repeated appearances in this blog: Charles Holden. The design dates back to 1932, the year Bounds Green station opened and from a time when the Underground was being subject to a complete reimagining in size, look and feel. Or rather, a complete imagining, seeing as how up until that point, nobody had seriously thought of or tried to conceive of the Underground network as one thing. Specifically, one thing that was deserving of coherent branding, original design and unique architecture. Holden and his management sponsor Frank Pick did. SPOILER: their efforts will probably comprise, oh, at least one-fifth of my 150. 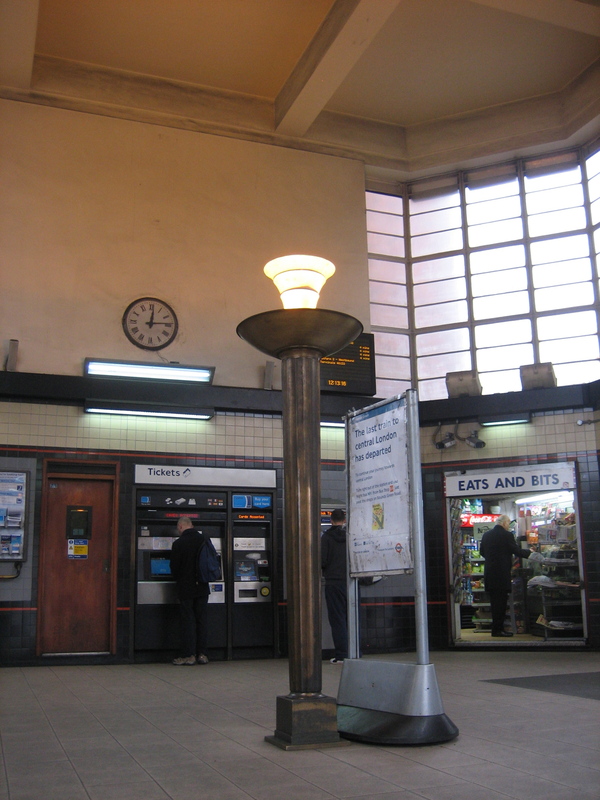 The uplighters at Bounds Green, besides being Art Deco at its functional finest, create a cosy, comforting atmosphere: perhaps not the most obvious of environments for the likes of Eats and Bits, but very much in keeping with the thinking of their designer. I’m not going to disagree with him. After all, Underground stations should be places you want to be, that you feel pleased and proud to be stepping into, and not just locations from which you want to flee as soon as possible and in which you’re loathe to dwell. 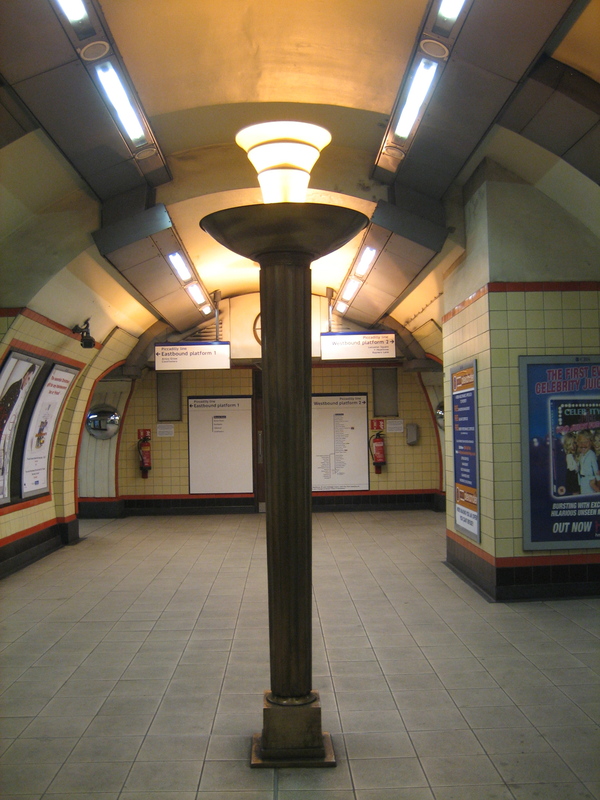 But there’s more to marvel at Bounds Green station than just three exquisite illuminations. I’m already looking forward to going back. I love these, they remind me of the Olympic Torch.